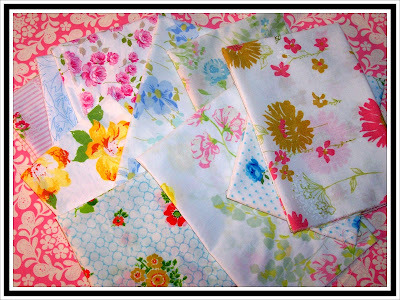 Quilt Taffy: Vintage Sheet Fat Quarter & Pattern Giveaway! WINNER Announced! Vintage Sheet Fat Quarter & Pattern Giveaway! WINNER Announced! Everyone's a winner today because I'm offering up this little pattern/tutorial, too. It's a large file.....give it time. and then save to your desktop. It should have it all to your desktop and then you can try opening it from there. I know it's not original or earth shattering or even extra special. 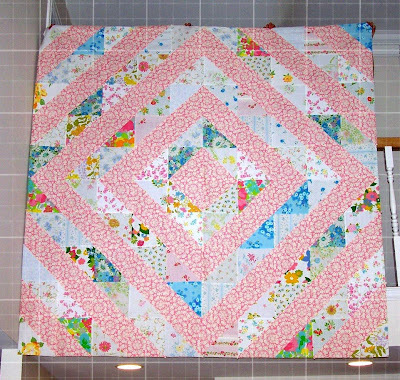 But we have enough quilting/piecing newbies that I wanted to try and spell out the inner workings of a triangle square. Easy cheesy. Grab a great fabric like this and go. to. town. "Ew. That's probably not a story we'd want to be telling." I love this book cover AND I love a brunette Cinderella. I thought you might care. Boy, this post is all over the place. Thanks for hanging in there today. I think you should split the lot up.. then more people will be happy! They are lovely.. if I were to win I would have to share with my sister....thanks for sharing! Thanks for the chance to win. I am a share the sheets kind of girl. I would split them so two people can win. I say SPLIT THEM UP! More winners, more fun! I can't get the tutorial to open even though I have Adobe 9. I don't think I have ever seen a brunette Cinderella, interesting! I have no shame and no vintage sheets so I say one winner. Two winners, share the joy. More people making Cinderella quilts = all good. Pretty, pretty...I'd say share, the more the merrier. Thanks for sharing your stash with us. Oh my gosh, I think I had most of those sheets on my bed growing up. (not all at one time...you know what I mean!) Does that make me vintage?!? I say split them up and share the love!! I would share, so enter me, please. Split them up, two people can have a fabulous surprise! Five would be fine with me, but ten would be even better! Thanks for the chance for either one. Well, the selfish me says all 10 please, but the more sensible side of me says sharing is nicer. Even though I am by nature a greedy person and would really love to have them all, I do realize that that isn't fair, so I will be generous just this once and say "split 'em up!" after all, that gives me double the chances to win!!! I would love to share these with someone else! THanks for the chance to win! I vote for sharing - but you've already been so geenrous with the terrific pattern/tutorial, thank you so much! 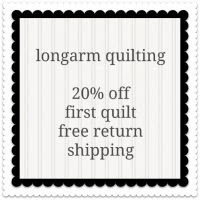 Blogland, thanks to all you lovely quilters out there, is an amazing resource that our mothers and grandmothers never had. I agree...split them up! More chances to win! Thank you for the tutorial, great for a beginner (me). Oh I am pretty selfish and I want them all but if you decide to split them up I can live with that too because I have none so 5 is still way better. Thanks for giving ANY at all. I say share the love. Thank you for the tutorial. I love the name. By the way my word verification is oxichic. I think that is a great new word. I am going to have to find a way to use it. My selfish inner half is telling me to type 10, but the unselfish part of me is telling me that if we split them, that 2 of us would get some! So I'm thinking split them! Either way, they are absouletly gorgeous! You are sitting at your computer just chuckling watching our little greedy yet giving selves check our moral compass. I am definitely all about sharing love and fun but those are delish and make me covet them all. But hopefully my true self prevails and I say split them up. I say one winner!! That one if I win I can give half to my momma. Oh, she'd be sooo thrilled! Love your pattern, especially the name and the use of vintage sheets. I'm pretty greedy so I want all 10, but to inrease the chance of winning, split them in two! Of course I would love to have them all! But today is my nice day, and I am willing to share with another quilting sister! I think you should share the fat quarters and maybe I win one! Thanks for the giveaway! Split the lot; goodies for more! I love that pink print fabric, too. Although I'd LOVE all 10, I believe in sharing the wealth, so I'd be up for splitting. But, since I never win... :( it won't really matter. deep down I want them all to myself, but rationally, I know I have a better chance to get any if they were split, lol. Thanks for the Rags to Riches Quilt pattern! I am planning to go thrifting today! I am also a sharing kind of girl. The more the merrier! Sharing would be nice. I've never had any vintage sheets before. They look gorgeous. I think they should be split up...like a stimulus to aid the quilty community. I'll say share. That's what quilters seem to be really good at. Very generous souls they are. I think you should split the proize, two chances to win are better than one, for those of us that are greedy. I'm all for sharing the love! I only have 1 actual vintage sheet in my inventory and I couldn't cut into that thing to save my live. It's from my childhood. And the Cinderella title is much better I agree. Have fun today! of course I will say, I love them and want them all. don't share, just how I am. If I were feeling mean and greedy I'd say 'I want 'em all for me', but it's spring, the sun is out, there's a brunette cinderella smiling at m - I'm in a sharing kind of mood!!! 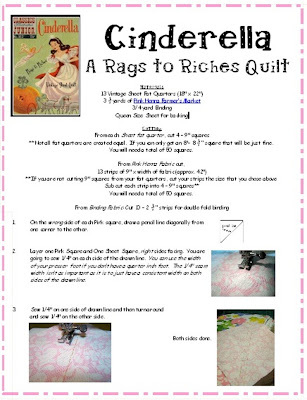 Love the rags to riches quilt, it's beautiful! Oh, definitely have two winners! It's more fun when more people win. Especially for such a fun giveaway! Thanks! greedily I'd really want all of them, but I would share...just to be nice. ;-) (As long as I got the one on the very very top to the right with the pink and mustard goldy colored flowers! I say split them so two people can win! Love the book cover too! Thanks for the tute. Today I'm going to say go greedy, but that's just because I can't find any cool vintage sheets. Normally I would be a share the love girl. I think it would be GREAT to share with several winners. Des, love the title of Cinderella, just right. I would have to say share the sheets, there are so many quilters out here in blogland. I'll post about it on my sidebar. Umm.. if you pull my name, I'll take all 10. But if you pull someone else's name, I think it should be split up so I have another chance! :) Funny that I teach my daughters to share all day but I can't seem to follow through myself. I would say give them all to 1 if I knew I was the one... but multiple winners increases my chances of getting atleast one cute quarter... that's a toughy! Either way, very generous! I think you should share the love! TWO winners! WooHoo! I say split them up! They are so pretty! Sorry, I am greedy and would like all of the fat quarters. I am always looking for new ideas. Thanks! Make quilts not war, man. It's all about love and peace so I think it'd be groovy (in a far out kind of way) to split the lot up. Dig what I'm laying down, cats? Rock on and stuff. 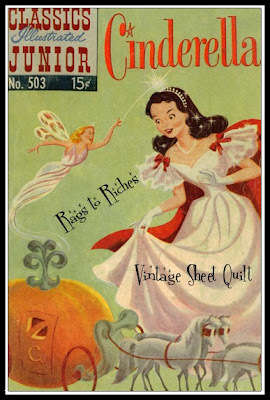 Oh, and that chic Cinderella, she does look groovy with dark hair. I would be thrilled to have all ten, but I would also be estatic with 5 for me and 5 for someone else. Either way, if sure would be fun to win! I love it all! all over the place. yes, I do want 10, but I'd settle for 5. (It's hard to share when it come to chocolate chip cookies and fabric! )I've been looking for those sheets at goodwill because I'd like to make the mod quilt sampler at ohfransson. Have you seen her site? Thanks for the freebie. Nice! I would love to win either 10 or 5. both would make me happy, because it's free..I'm feeling nice today so 2 winners! I'd say split 'em or give fat eighths so all ten could be sampled by the winners. thanks for the chance! I would love to win them all but I think you should split them up and share the love. Oh I want them ALL! But, I really do think you should split them up, more fun for more people that way. I would love to win all 10 but probably should split it up so two people can be happy! I say split them up...they are so pretty! spread the love among us vintage sheet lovers! That first comment, Kim, talks about sharing with her sister -- what a sweet, charitable, swell thing to do. Or maybe that quilt is for me, I'll act surprised. I want the book! Hmmm...five would be nice, but I'm not ashamed to say that ten would be better! Thanks for the pattern! I would be so happy to have just half. I would be double happy to have all 10. 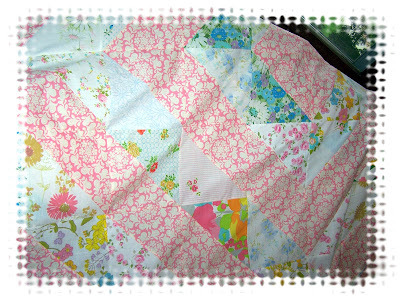 I have discovered the joy that is quilting with fat quarters. 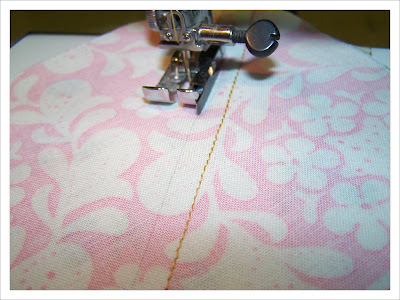 What beautiful fabric and a thoughtful giveaway! I say share, as you are sharing/offering each of a chance to win. I'm into sharing --- so I think you should pick two winners. Love your blog. Love your tutorials. I always get such great ideas. Thanks for the tutorial! You're right, I'm a newbie and had no idea what you were talking about with the triangles, so that little tutorial helped! Greedy!! I want them all! Actually, I know someone who would love a snuggle up quilt out of them and I'd love to make it for her, so I'd be a Giving Gal too. The best of both!! Wow! They're pretty! I'm definitely Share the Love type of Gal. Hope I made it here in time! I would love to get 1,5, or 10 - they are lovely! Everyone loves to win of course...I know I do. So however you decide to divide it up is great with me. Good luck everyone! Yes a bit like my quilt I posted today. Love yours. Cinderella is a perfect name for it. I love the fabrics. I also love a brunette Cinderella. It gives me hope. ha ha ha. 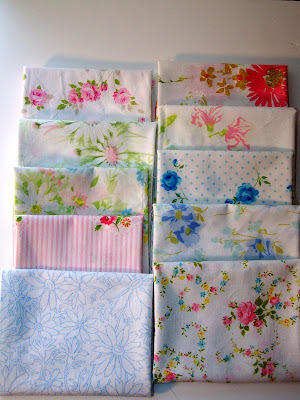 Anyways, thanks for linking up your Rags to Riches pattern to the Vintage Sheet Blog.